For those who aren’t clear on this, in 2002 Canada ratified the Kyoto Protocol, which the Harper government has simply walked away from (clearly to Alberta’s advantage, which is what all of this is really about). Our commitment under Kyoto was a modest reduction of greenhouse gas emissions to 6% below 1990 levels by 2012. It’s not just that we aren’t even close, it’s that the Harper government’s contempt for our international treaty obligations has put us an astounding 24% above 1990 levels, and rising. Harper’s also planning some sabre-rattling in the Arctic over gas and oil reserves. We have no reason to be showing our war face because there is already a long standing international panel negotiating the sovereign claims of a number of arctic countries, including of course the U.S., Canada, Norway and Russia. Norway and Russia, in fact, have already negotiated a settlement on disputed claims without a single shot fired in anger. But Harper wants to mix it up with troop deployments and, eventually, those shiny new jets, so that’s what we’re going to do. It’s the Russians specifically we will be baring our teeth to. So that should go well. This is completely contrary to Canada’s long history of superior diplomacy in such matters. We are not war makers. We are peace keepers. But not in Harperworld. Finally, the only reason there is any negotiation necessary among the nations involved in these claims disputes is that global warming is reducing the Arctic’s seasonal ice, making those resources more accessible. That’s the same global warming the oil companies invest tens of millions of dollars every year to deny is even occurring. It’s a death spiral of cognitive dissonance: global warming is not occurring, but its occurrence makes available fossil fuel reserves that will in turn exacerbate global warming — which is not occurring. 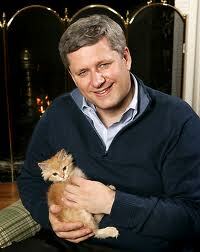 Canada, by way of the Harper government, is apparently going to be a charter member of this suicide pact. And it’s doing so with the support of just 39% of the voting population, something the remaining 61% ought to keep in mind. We will, of course, also have lots of Frye to provide perspective on our wretched history of exploiting and despoiling our wilderness whose ecosystem we hold in trust. This entry was posted in Canada, Current Events on July 9, 2011 by Michael Happy.